Before you pack up your car for an overnight road trip with your dog, you need to carefully consider the hotel where you will stay. Will the hotel allow my dog to stay with me? What will I do if my dog barks at night? These are just a few of the issues that you need to think about before you select a hotel. 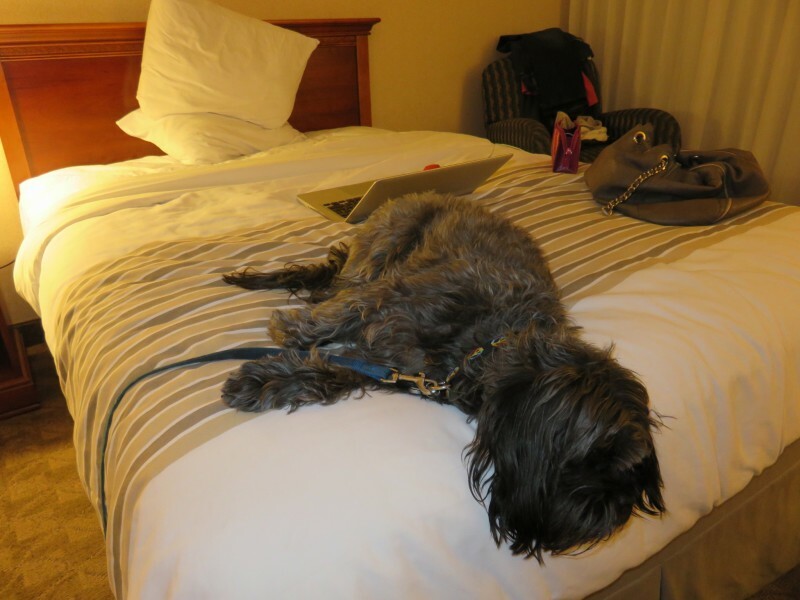 When planning my spring road trip with my mom and our dogs , I knew I needed pet friendly hotels. Anyone who has traveled much knows that things don’t always go as planned on any trip. Throw in 2 dogs and a route that covers 4,000 miles through 9 states, and the trip is bound to teach you some major travel lessons. 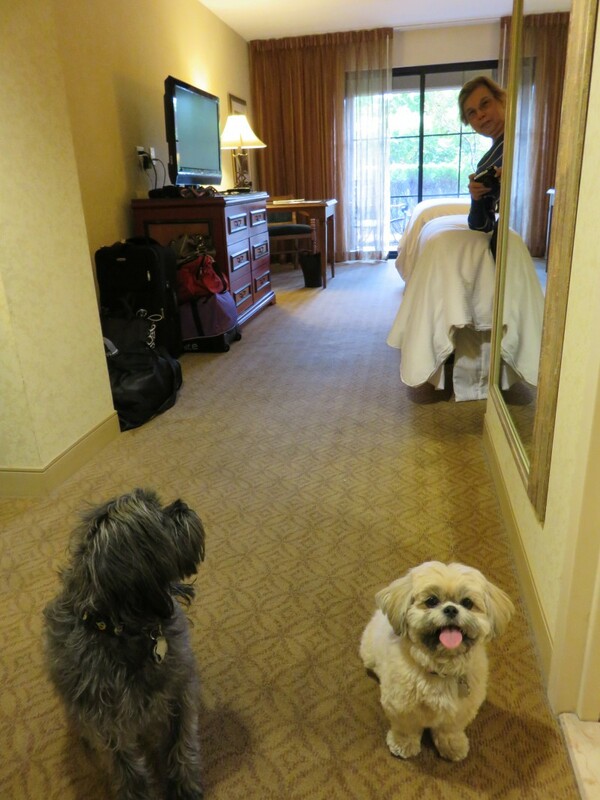 I learned a lot about traveling with dogs and staying in hotels. I hope my tips will make your future trip with your dog go more smoothly. 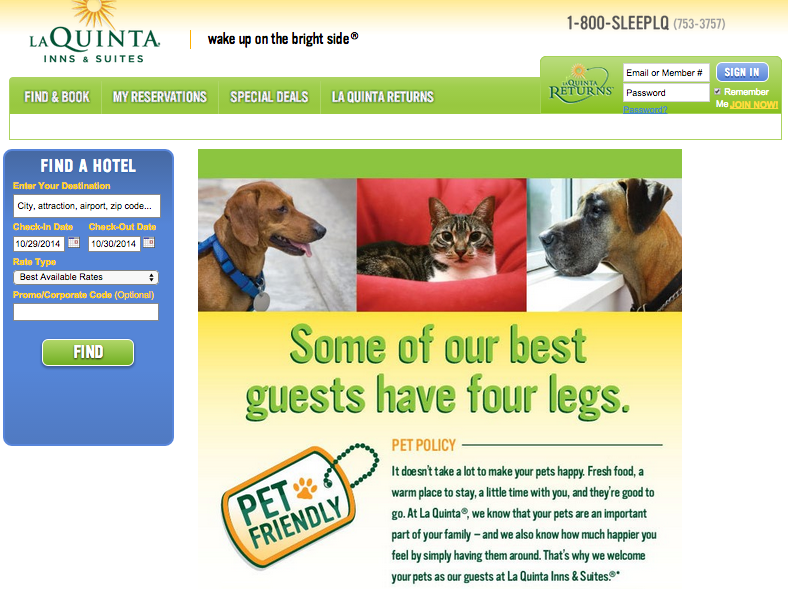 Some hotel websites make it easy to find the pet policy. Others bury the restrictions in the room rules section or some other obscure page. IMPORTANT…pet policies vary by location at even the most pet-friendly hotel chains. Check the policy for the location where you will be staying! Unless the hotel’s website is very clear about the pet policy, I would call and make sure you won’t have an issue when you arrive. Many hotels only allow 1 or 2 dogs, and many have size restrictions. 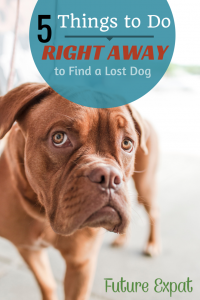 If you are tempted to just sneak in your dog so you don’t have to pay the pet fees or follow the restrictions, just imagine what you would do if you were caught and had no place to go for the night. I really wouldn’t risk it. Be prepared and plan ahead with a hotel that will allow your pets. Most hotels do not allow you to leave the dogs in the room unattended, though I have a feeling a lot of people do it anyway. We were too worried that the dogs would bark while we were gone so pretty much took them everywhere with us during the trip. The first time we tried to leave them alone in a hotel room for a few minutes, we stood in the hall and listened to them bark for a few minutes before going back. Later in the trip, they seemed more ok with the hotel noises and we did leave them to run down and grab breakfast a couple of times. Each time we left, we tiptoed a few doors down and then waited a few minutes to make sure they weren’t going to bark. The rules really vary from hotel to hotel. When I was researching where to stay, I even found a few that didn’t allow dogs on the bed. Neither Milo nor Lexi shed, so we could have gotten away with it, but I didn’t want to stay somewhere that was going to nitpick what my dog could do. When choosing hotels that offer a free breakfast, keep in mind that you are not allowed to bring your dog into the dining area. You’ll either need to leave the dog in the room while you eat quickly, fill a plate to bring back to the room, or you’ll have to eat sitting in the main lobby chairs with your plate on your lap. I had a travel partner so we could take turns going to get food. If you are traveling alone with a dog, managing meals will be more of a challenge. Milo almost never barks, so I was totally unprepared for his reaction to what I consider normal night time noises. During the day, both dogs ignored the noises coming from the hall. But as soon as we turned off the lights and crawled into bed, both does went into alert mode. The first night they were up EVERY hour, running to the door and barking. It startled us at midnight. At 4 AM, it wasn’t so cute. It took about 3 or 4 days for the dogs to get used to hotel night noise and stay quiet. I found a way to teach Milo what I expected that worked really well. On the second, I kept Milo on a leash when we went to bed. I wrapped my hand around the end of the leash and went to sleep. When he would jump up, his movement and bark would wake me. I would grab tight on the leash as he tried to jump off the bed. He quickly learned that he couldn’t get down and would settle down and go back to sleep. After 2 nights on the leash, he didn’t need it anymore. The worst night, other than the first one, was the night we stayed in a motel where people could drive right up to their doors. There was a lot more noise outside our room compared to a standard hotel hallway. Instead of only hearing the people who had rooms past our room on our hall, the dogs heard every car and every person on our side of the motel. I know that Motel 6’s are dog friendly, but I’ll never opt for the motel setup again when traveling with dogs. Where Will Your Dog Go Potty? 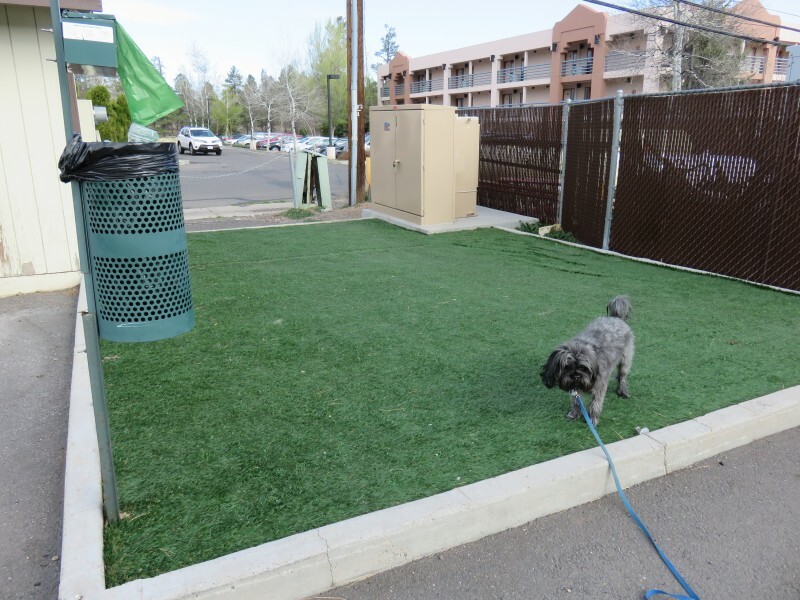 Since Milo is used to going outside to go to the bathroom as soon as we wake up and just before we go to bed, I wanted to find hotels that would provide some grass close to the front door. While a few hotels actually offered designated bathroom areas, most did not. The only hotel that did offer a designated area had a tiny patch of grass plus some baggies. I don’t know about your dog, but Milo likes to go on tree trunks, bushes or even tall weeds…but rarely chooses a flat patch of grass. We actually only used the designated area at that hotel once…and the rest of the time he went by the bushes that lined the parking lot. When I was researching hotels, I took advantage of Google’s satellite map view to see where the options would be for our potty outings. I actually eliminated a few hotels because it looked like a long walk to get to any trees or grass. That said, all of the research in the world can’t guarantee a pleasant bathroom experience. 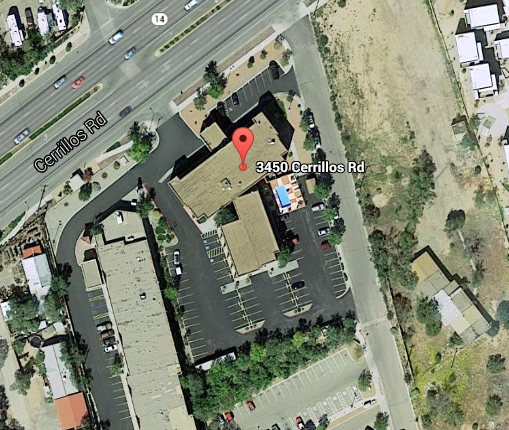 The hotel above is the Holiday Inn Express in Sante Fe, NM. I was really excited when I learned they had a good pet policy, low rates AND a big field next door where Milo and Lexi could go to the bathroom. However, the satellite picture doesn’t show that this field was filled with sticker bushes, burrs and trash. The first time I took the dogs into this field I ended up carrying them both back to pavement where I could dig the burrs out of their paws. You wouldn’t believe the pitiful looks I got from Milo when he felt those painful stickers between his pads. Coming from the lush midwest, Milo and Lexi always have plenty of grass to do their business. We quickly learned that in some parts of the southwest, it’s hard to find any grass at all. Surprisingly, Milo and Lexi both learned very quickly to pee on gravel and bare dirt. My advice is that you should use satellite images to try to choose hotels with grass, trees or shrubs, but don’t get too worked up over it. Almost every hotel has some landscaping that will work near the doors and the dogs will adapt quickly. 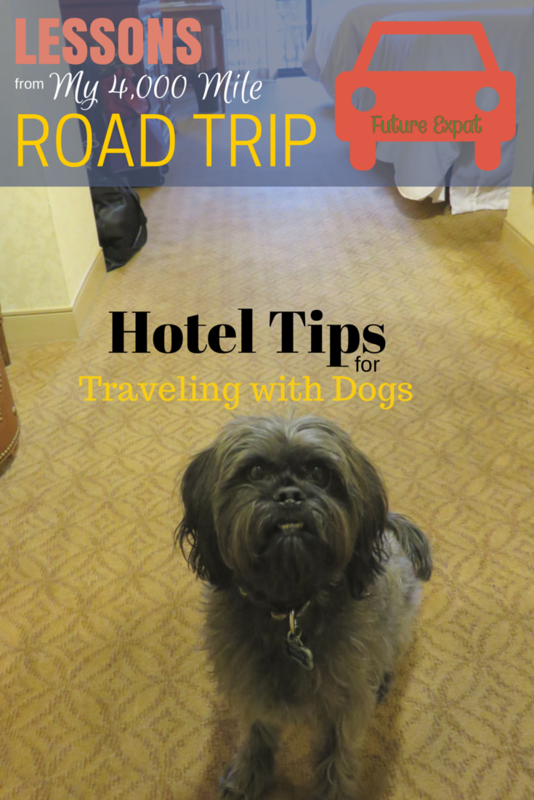 What travel tips can you add about planning hotel trips with dogs? Wow, good on you for taking the dogs, I would see it as far too much hassle. We take our Black Lab on holidays where we stay in rental cottages, the most extravagant we have got is when we stayed on a house boat a took him- he loved it! He is pretty well behaved, but I wouldn’t do a full road trip with him. You sound like you had a great time and so are the dogs. Thanks. I have a pup I plan to travel with one day. Wow, great tips! I wish I had read this before we moved across the country with our dog. We did ok, but these are definitely handy tips. Pinning for other travelers. This is extremely helpful. We have 3 large dogs and haven’t attempted to travel with them except to our ski condo which has strict rules as well. I don’t know that we would ever try traveling with all of them but down the road I could foresee trying to travel with one. Great post! I pinmned it twice: once on my Dogs board and once on my Tips board. This post was very popular at last week’s party so it will be featured on the upcoming Wonderful Wednesday Blog Hop. In fact, TWO of your posts are featured. Yipee!!!! I don’t know how this comment slipped in without me noticing. Thanks so much for giving me a place to share my posts. I love your party and am thrilled to have 2 of them featured! Wow, lots of things to think about. I don’t have a dog but know plenty of people who do and travel to hotels with dogs. Good for you for being concerned about barking. I like LaQuinta’s dog-friendly policy, but didn’t like staying on the floor with all the barking dogs. In fairness, it sounded as if all the owners were trying to contain the barking. Have you considered a white noise machine? One friend does that to keep her Pom from barking so much. Thanks for coming and linking up at The Weekend Social. Please be sure to come back next week starting Thursdays at 9PM EST! I hope to see you there! Very nice an useful tips as always, thanks for sharing with Hearth and soul blog hop pinning. Wow. I love your tips! We’ve taken Hunter on a few trips where a hotel was needed and I wish I saw this beforehand. I realized that a lot of hotel’s pet policies states 75lbs and under pets only so that sometimes poses a problem because Hunter’s about 72lbs. I can’t imagine any hotel asking you to weigh your dog, so at 72 lbs, you should be ok anywhere. Now if Hunter was 90 lbs, you might have a hard time sneaking him through that weight limit! Excellent post! What a great trip – and 4,000 is a long way! A way around the dog-weight-checkin issue would be to carry a pair of $10 weight scales in the car so you can show hotel staff if your questioned. That’s a great idea…or simply get something from your vet that states the dogs weight. I have looked at hotels to bring my dog before, but unfortunately, for the hotels I was looking at,the pet policies didn’t include large dogs, only small dogs. I think you are very brave to travel all those miles with dogs. I hope they do well in the car! They did great in the car. I brought a medium sized crate for the hotels…just in case…but never even brought it in from the car. To make it fit better, I left the top nested in the bottom and filled it to the top with beds and blankets, so the dogs could ride in it just a few inches from the top edge. They loved it. We take our little dog with us on all our trips. We’re pretty attached to him. We often rent a car to take trips. I would add that most rental car places are okay with pets so long as they don’t have to clean up fur afterward. Some have policies don’t allow pets, but then if you ask the employees, they will tell you to just keep it clean. We cover the seats with blankets and then before we return the rental car, I vacuum and use a lint roller to get ALL the fur. I would keep in mind that my pet is has short fur that doesn’t shed much and we always bathe him first. And, you know, some rental car companies may not allow pets, even if you’re clean. Thanks for sharing at the Retro Re-Pin Party 🙂 I hope to see you there next week. I’m starting to plan a trip that includes kids and our dog — appreciate the experienced tips! One thing we learned with our dog. Is at bedtime she was on full alert and could hear the hall noises. We took our extra blanket and pillows and put them against the door. It helped block the noise and light . We slept fine every night after that. I always left the do not disturb sign on our door so no one else would knock on door and make her bark. 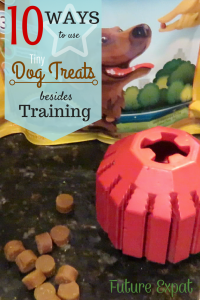 Great tip to lower the distractions for your dog! Thanks for your tips. We are moving from VA to TX and of course, our four dogs are moving with us. We have 2 large dogs, 1 medium-sized dog, and a small one. Three of them are elderly rescues. We are trying to make this trip as easy as possible for them, particularly for the rescues. They really take their anxiety cues from us so we are trying to think of every possible scenario. Wish us luck! Good luck! A lot of hotels have limits on dogs (number and size), so I would call and plan hotels before you go. And with 4 dogs, it might be easiest to pack a cooler with food for meals on the road and hit a park. Meals on the road were the hardest part in my opinion, but we only had 2 small dog for the hotels.